Air shipping is for people looking for speed, safety and convenience, since it is a very extensive service network, whether you are importing or exporting. Through partnerships with the most respected agents in Brazil and abroad, we offer quality, competitive rates and online tracking at the different origins and destinations. You can also count on DOOR TO DOOR services and CARGO CONSOLIDATION. OCEAN FREIGHT Ocean shipping offers competitive costs and flexibility for small cargoes and/or extremely large cargoes that need special treatment . You can count on us to handle your imports and exports to or from any point on the five continents. The best transport solution for small cargoes that do not need an entire container. Optimizing the space occupied by the cargo within the container by sharing it with the cargoes of other clients makes them highly competitive. We offer more regular, direct departures to / from the main ports on the five continents, ensuring the delivery of your cargo to the destination of your choice. In this case, your cargo will occupy one or more containers. Because of our partnerships in this segment, we can determine the most suitable shipping company according to the origin / destination of the cargo, the optimal route with the best cost / benefit, according to your priorities, thus saving time and expediting the delivery of the cargo to the the destination of your choice. If your load is extremely large, with a size and weight outside standard container measurements, you need special services. We provide project cargo transportation on RO-RO ships (for rolling loads), in specialized ships for loose cargo (Break bulk) or in special equipment for container carriers. Ground shipments are also for those who want more competitive costs and flexibility for small cargoes and/or extremely large cargoes that need special treatment. We have specialized agents around the world for each specific kind of cargo. 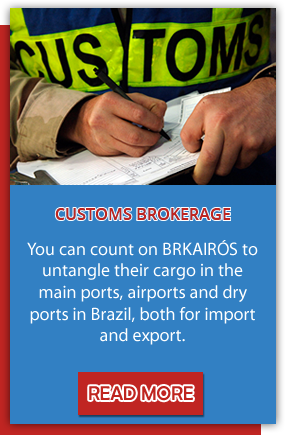 You can count on BRKAIROS to untangle your cargo in all the major ports, airports and dry ports in Brazil, both for import and export. Ground shipments are also for those who want more competitive costs and flexibility for small cargoes and/or extremely large cargoes that need special treatment . We have specialized partners for each specific cargo, both in Brazil and abroad through our agents around the world. The perfect solution for people seeking to minimize national and international transport costs. We have warehouses near all the major ports and airports worldwide which allows shipping and handling costs to be split among multiple customers. A highly-sophisticated ID tag system prevents cargoes from getting lost or delivered to the wrong customers.